Offering High Quality Hand Braided Rawhide Horse Gear – Bozals, Romal Reins, Hobbles, Hondas, Breast Collars, Headstalls, Quirts, Headstalls, Reatas, Chokers for Horses, Chokers for Women, and Bracelets. Including Mecates, bit chains and ropes. Wayne works with silversmiths and saddlemakers to create some of the finest products made. We have some items ready to and of course, offer custom items. See our website and Facebook page for additional information and photos. 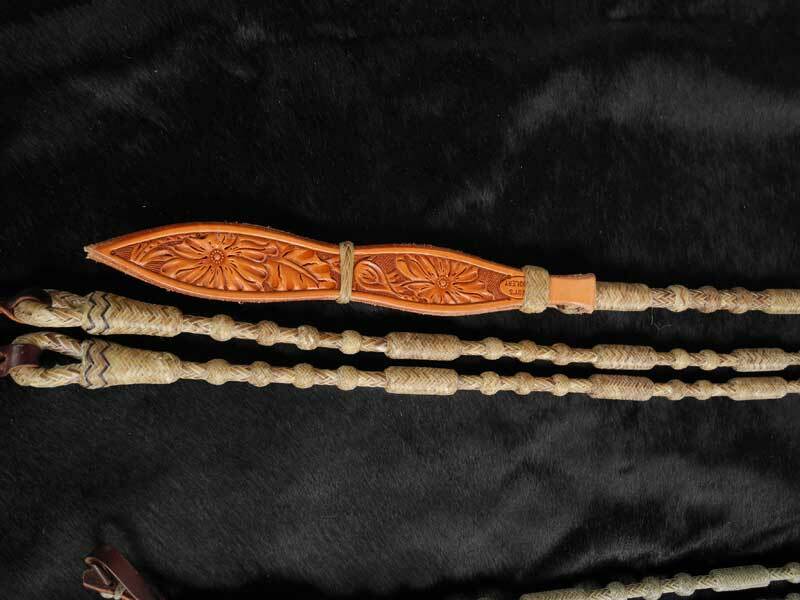 Over 20 years ago, Wayne began to learn the art of rawhide braiding in order to make a couple of sets of gear for his wife and himself. That’s what started the whole thing. Wayne became passionate about his work concentrating on the California style of braiding and he always strives for perfection. Since then, he has been lucky enough to attend the Traditional Cowboy Arts show and learn more about the art from other master braiders such as Nate Wald and Leland Hensley. In 2009, Wayne received the prestigious award of Braider of the Year from the Academy of Western Artists in the U.S.